Some people believe the DUP and the Tories are not a natural fit: that Sammy Wilson is lacking in the kind of urbane manner that Tories naturally display, and similarly that you could never find a P G Wodehouse figure like Jacob Rees-Moggs in the ranks of the DUP. Those are indeed stand-out differences. But there are similarities, particularly when it comes to being perverse. Take the DUP. The one thing they were insistent should not pass was Theresa May’s withdrawal deal. Why? Because it contained the backstop, a safety-net guarantee that would allow trade and social interaction to continue across an invisible border in Ireland. In addition, as people living in border communities will tell you, the Conservative leader’s deal with the EU would leave the north in the happy position of having access to the UK market and to the EU market. What’s not to like? Everything, is the DUP retort. We don’t want to be treated differently from other parts of the UK, even if it leaves us better off. Something of the same attitude can be seen in the response of the Tories to the ‘flextension’ offer of the EU. You want more time to sort things out, UK? Fine. Let’s give you a year and if you find agreement among yourselves any time during that year, great, you can cut the extension time short. The reaction of many Tories to this offer? No, no, no. We’d really prefer NOT to have a longer extension which can be cut short at any point; we want a tighter deadline. Since the Tories have spent three years failing miserably to meet tight deadlines, you’d think the offer of time to sort themselves out would be grabbed with both hands. Uh-uh: we are opposed to your generous time-offer; give us a less generous one. Perverse, moi? Not that the Tories would confess to such perversity, any more than the DUP would confess to having been shoved to the margins of the Westminster knife-fight. 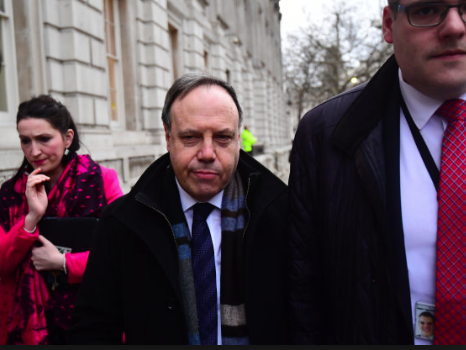 The Tories appear to have turned their attention to getting the necessary support from Labour to push a deal through parliament, which support would of course make the DUP’s Terrible Ten look irrelevant. But Arlene was on telly last week telling us that of course they were still central. And that they were sponsoring a special display of unicorns’ horns at the DUP HQ next week. Meanwhile, there’s a little Brexit matter that’s been overlooked until recent days: citizens’ rights. The Good Friday Agreement allowed people living in the north to identify themselves as British or Irish citizens – or both – as they chose, and to have the accompanying rights of EU citizens. Brexit has come trampling through all that like a diorrhea-suffering heifer through your rose garden. Britain has now made clear that people in the north will, like it or not, be UK citizens (or British subjects, to be more precise). So when the UK leaves the EU, northern nationalists and republicans can kiss goodbye to any notion that they have rights springing from EU citizenship. You want EU citizens’ rights? Tough, you don’t qualify. You’re a British subject and the UK is outside the EU. If the DUP and its Tory buddies had sat down and thought up a plan that would provoke the irritation and anger of as many northern nationalists/republicans as possible, they couldn’t have done a better job. There are people who talk about the need to get Stormont up and running again. Thanks to the efforts of the Tories and the DUP, nationalists/republicans want no such thing. Their gaze has switched from Stormont as a stopping-off point, to what is and always has been the problem in Ireland: Britain’s claim to jurisdiction of six counties to the north of an arbitrary line in Ireland. If unionist politicians can’t see how they’ve been a major force in moving nationalist/republican focus away from Stormont and to the elimination of the border, then like the Bourbons they have forgotten nothing and learnt nothing.